Located at 80 meters from Kamari Beach, Proteas offers air-conditioned rooms with free Wi-Fi and a balcony or terrace overlooking the bougainvillea garden. The center of the town is located at 3 minutes on foot. Room located at 800 meters from the beach. 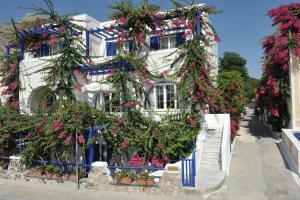 It has air conditioning, free Wi-Fi and a balcony or terrace overlooking the bougainvillea garden.